I've been watching this deer for 3 years and have hundreds of trail cam pics. He was a 10-pointer from the first time I saw him and over the past 3 years he just got taller and the mass piled on. He would dissapear right around Oct 10th and I wouldnt get a picture of him again until right after Christmas the past 3 seasons. I hunted opening weekend of Bow, Friday I sat all day and didnt see him. On Saturday the wind changed so I decided to hunt a different stand. As it got light it was very foggy, I waited until I could see about a hundred yards. There was nothing within sight, so I decided to blind grunt about six times. Within about 5 minutes I saw movement to my left in a thicket. I stood up and grabbed my bow. As the deer went through one opening I immediately knew this was a shooter. I looked at the angle he was taking and started to look for openings for me to shoot... I only had one. As soon as he came into the opening I mouth grunted. I was already at full draw and when he stopped my arrow was already on its way. The shot was at 32 yards, he only went 70 yards and dropped. He weighed 235 lbs... and 6 1/2 years old. He green scored 153. I was using a Hoyt Carbon Element. 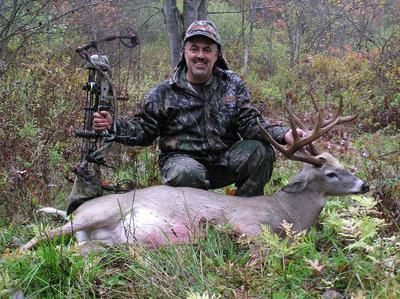 The buck was shot in Nineveh, NY. My 3 year quest was over. What a Great ride it was matching whits with this deer!!!!!! !